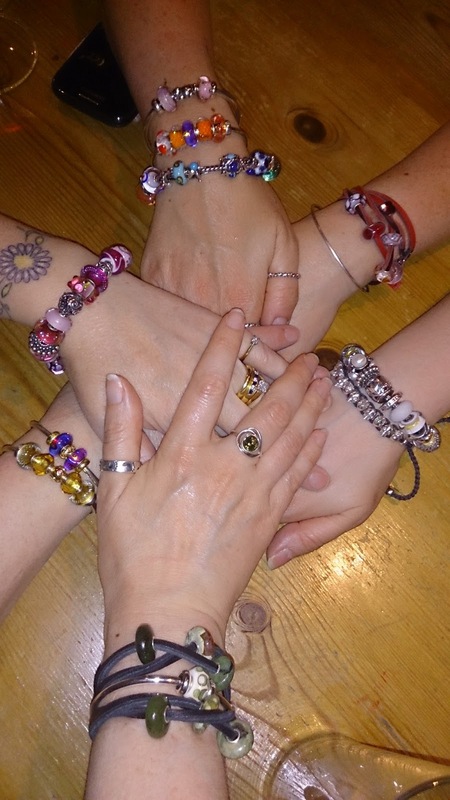 Back in May last year I attended a lovely Troll Meet in Yorkshire and whilst our focus was most certainly on Trollbeads, we are all jewellery lovers and so naturally swapped details about what we were wearing. A bracelet caught my eye, and I wasn't the only one who was smitten with it! It was of course the Links of London Skull Friendship Bracelet; if you've taken the time to read my new About page, then you'll know I'm drawn to jewellery with skulls, so no surprise this one caught my eye! My bracelet arrived in style, although I honestly thought we'd received a parcel of shoes for next door by mistake until I saw the label was addressed to me - the box is huge and most certainly will not fit through your letterbox; your dog flap perhaps. Once you get into your shoebox, you get a Links of London Bag (ah that's why the outer box was so big), a catalogue, information letters and your own mini-presentation box - I love jewellery that comes tied to a padded cushion! If you're ordering online and don't have the chance to have the "in shop experience" it's nice to get some of that at home. Obviously for us bloggers who are incapable of tying ribbons up in a pretty presentation style we have to take the photos now, or we'll never be able to recreate that professionally tied ribbon moment for you ever again! I'm no stranger to friendship bracelets, back in my late teens / early twenties I used to wear these a lot. Fast forward to now and the simple friendship bracelet has been transformed into a piece of jewellery I most certainly will not be wearing 24/7 for X amount of time and then cutting off before it walks off my wrist by itself... apparently according the information that came with my bracelet, I can not only take this one off but wash it too! Although one could argue mildly about the 24/7 element, I was so smitten with this when it arrived that it didn't make it off my wrist until I was about to go to sleep and it was the first thing I put on when I woke up! This bracelet had to be saved up for, as unlike modular jewellery where you can buy a piece at a time, this is not an option here. In addition I've been stalking the Links of London sales since last May, and whilst some of the many variations of this bracelet have been on sale, some with a 50% discount, they've never had this one (silver with grey) in the sales that I've come across. What prompted me to get this now, rather than later (I'm so rubbish at saving up) was a discount scheme at work, it just so happened that one of the places I could shop with was Links of London. Although there were a few days left for the promotion to run, I didn't hesitate, several clicks later and it was on it's way. I guess that's one of the benefits of so much window shopping and wish list making, you've already decided you want it; it's just a case of waiting for the right moment! Finally, before I go, let me share with you that this is the 200th blog post on Curling Stones, which after all is a bit of a milestone! I wanted to deliberately schedule what I wrote about today, and a friendship bracelet felt rather appropriate as I wish to pass on my love to you all! Give your friends some love; that's something precious you can do for free! I am so utterly, totally, bitterly jealous (but you know I love you). It's stunning and so perfect for you. I love that feeling when you've wanted something *forever* and finally it arrives! Yep you're right, this is going to be a firm staple I'm sure! Looking forward to it oxidising a little as it's very shiny at the moment; good to know it can be washed too... given it's going to get such a lot of wear! Definitely not the friendship bracelets that I remember as a kid either, but I do think that one would suit my style better now too :D Looks like a very versatile piece, able to be worn on its own as well as in a stack. And I bet would look great with your Story bracelet! Thank you, I've been aware it's been coming up for a while and wanted to choose something special (to me) for the 200th. Yes I think this is very versatile, I've not gone beyond wearing it on it's own yet but my friend wore hers with a very neutral troll bracelet which looked very elegant! I've noticed already that it goes beautifully with my labradorite ring, the colours really complement each other! Such a special bracelet for you and am so glad you finally got one!! Yep, it was a very special meet; was thinking back on this and our recent one and feeling all soppy so wanted to do something special for this post! Great bracelet ander congrats wurg your 200th blog post... Want to ready more and more from you in the future ! Oh that's fabulous Patty, it really cheered me up and made me giggle and at just the right moment as I was struggling with a pesky letter for my A to Z series next month!